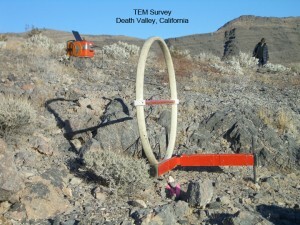 Exploration geophysics gives a geologist access to the subsurface geology when drilling is not possible, and is a key part of our exploration geology tools. Hydrodynamics conducts geophysical surveys in some of the most remote wilderness areas of the U.S. not accessible with drilling equipment. These surveys are conducted in support of our exploration well siting, groundwater studies, and energy storage development projects. Advanced geophysical data modeling programs are used to analyze and present subsurface data in a form that supports geological data needs. Our goal is to build the most accurate picture of the geological structure of the underground and to find valuable resources. The success of our geophysical surveying program is selecting the right methodology for the subsurface geological conditions, access to the study area, and our clients’ geology data requirements. 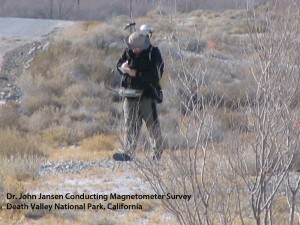 Geophysicist Dr. John Jansen is a leading applied geophysical survey scientist that holds patents on geophysical technology he developed and on the application of geophysical survey methodology to extremely complex geological conditions.